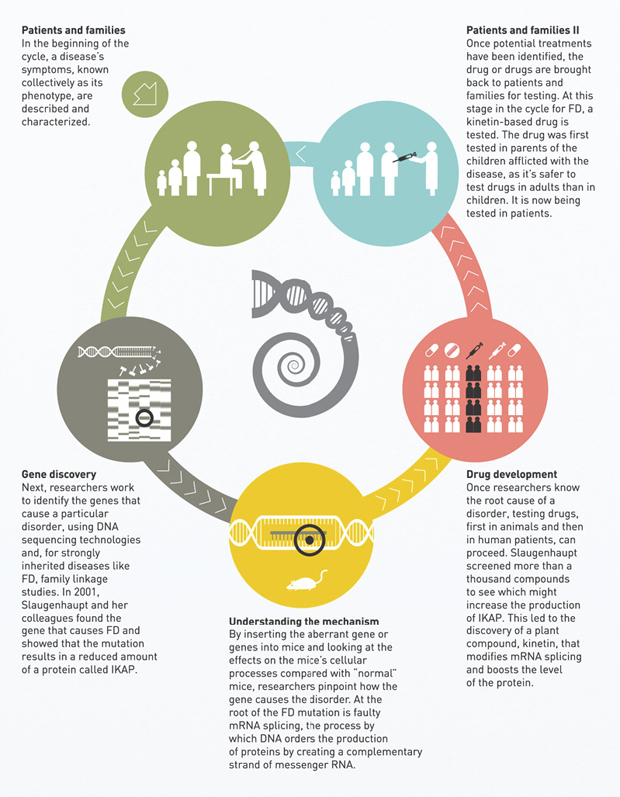 Whether researchers are studying a single-gene disorder or a complex one, their work follows the same basic cycle: They start by studying patients’ symptoms and, ideally, end by testing a treatment in those patients. Thanks to work by Susan Slaugenhaupt, a principal investigator at Massachusetts General Hospital’s Center for Human Genetic Research, the cycle is nearing completion for familial dysautonomia (FD), an inherited disease that is carried by one in 27 Ashkenazi Jews, causing neural problems that result in stunted growth, respiratory difficulties and severe eye problems. Here was her process.